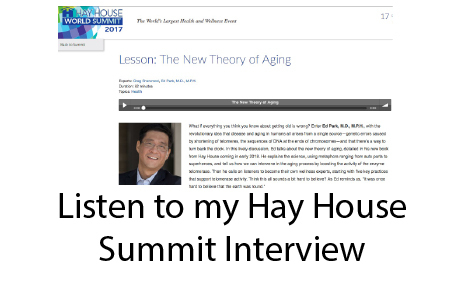 Blog Listen to my Hay House Summit Interview "A New Theory of Aging"
From May 6th-May 23rd, you have free access to the 125 interviews and videos of the 2017 Hay House Summit. Click here to register for free and listen for free. It is quite a lively discussion and I am grateful to Greg Sherwood for the interview. 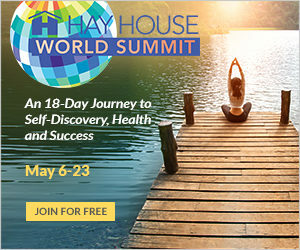 There are so many great authors and I particularly recommend Wayne Dyer, Teal Swan, and Eckhart Tolle. There are so many great things to learn so please take advantage of this temporary offer. We dive pretty deeply into Koch’s Postulates (or how to establish disease causation versus correlation), the Cancer Stem Cell Theory, the ecology of stem cells, and other important concepts related to health, aging, and wellness. If you have an hour-long commute – I highly recommend spending it with me and Greg. It is a very concise and engaging voyage into the themes and ideas that I have tried to disseminate over the last 8 years.